The Test Page, illustrated below, is used to determine what instruNet hardware is attached to your computer, and to test all instruNet hardware and software. After each test, a report is printed to a miniature text editor within the Test Page. The user can then type notes into this window and save them to disk as a text file, to later be opened with the Open button in the Test Page, or a word processor. The Test Page supports the standard text Cut, Copy, and Paste commands, in addition to typing (i.e. Control X, C, and V in Windows). 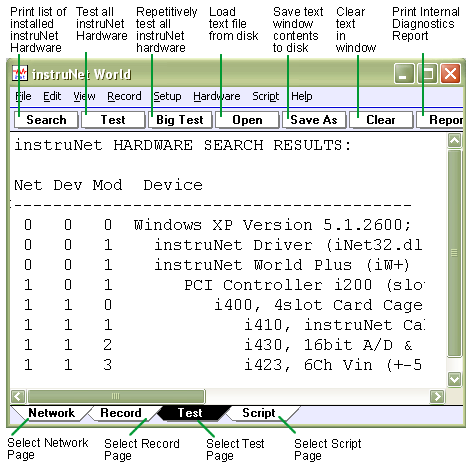 To select the Test Page, press the Test tab at the base of the instruNet World window. Generates a report, similar to that below, that lists all instruNet hardware attached to your computer. This includes all Controllers and all Devices. If this report disagrees with what you think is out there, please check your cables and consult the "Verify That Your System Is Working Properly" discussed here . 1 1 2 i430, 16bit A/D, 16se/8di vin..
Click the Test button to test all Controllers, Devices, Modules, Channels, and software. This test requires less than a minute and when done displays an alert similar to that shown above. A report similar to that shown below is also printed to the Test Page's text window. If you incur a problem, please visit Troubleshooting. We ran 0.542568 million tests and did NOT hit 1 error. Big Test is identical to Test except it runs continuously until you press the mouse button down and hold it down until the test stops. It will run all night if you let it. This is helpful at identifying intermittent problems that occur once in a blue moon. Loads a text file into the Test page's text editor. Saves the contents of the Test page's text editor to disk in a text file. Discards the text in the Test Page's text editor. Prints an internal diagnostic report to be emailed to your instruNet supplier for comment when debugging. After pressing this button, select this text (Select All under Edit or Control 'A'), copy it to the clipboard (Copy under Edit or Control 'C'), paste it into an email window (Paste under Edit or Control 'V'), and email to your supplier. Also, a Diagnostic Report can also be generated by pressing the "SAVE DEBUG REPORT TO DISK" button within some error alert dialog boxes. For more details, please see Diagnostic Reports. Prints the Test page text to a hard copy printer. Requires instruNet World PLUS (iW+).